In layman's terms, there are two types of links: inbound and outbound. Outbound links start from your site and lead to an external site, while inbound links or backlinks, come from an external site to yours. e.g. if cnn.com links to yourdomain.com, the link from cnn.com is a backlink (inbound) for yourdomain.com, however the link is an outbound link from cnn.com's perspective. 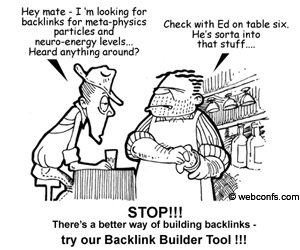 Backlinks are among the main building blocks to good Search Engine Optimisation (SEO). The number of backlinks is an indication of the popularity or importance of that website. Backlinks are important for SEO because some search engines like Google, give more credit to websites that have a large number of quality backlinks, and consider those websites more relevant than others in their results pages for a search query. 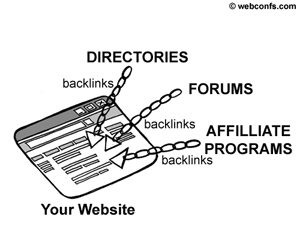 Even if plenty of backlinks come to your site the natural way, additional quality backlinks are always welcome. 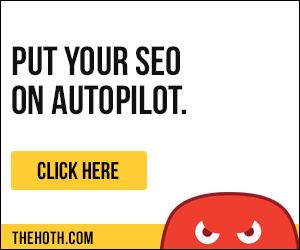 When you enter the keywords of your choice, the Backlink Builder tool gives you a list of relevent sites from where you might get some backlinks. If you are serious about your Web presence, getting listed in directories like DMOZ,Yahoo and Jasmin directory is a must, not only because this is a way to get some quality backlinks for free, but also because this way you are easily noticed by both search engines and potential visitors. Generally inclusion in search directories is free but the drawback is that sometimes you have to wait a couple of months before you get listed in the categories of your choice. You can offer RSS feeds to interested sites for free, when the other site publishes your RSS feed you will get a backlink to your site and potentially a lot of visitors, who will come to your site for more details about the headline and the abstract they read on the other site. Although this is hardly an everyday way to build backlinks, it is an approach that gives good results, if handled properly. There are many sites that publish news announcements and press releases for free or for a small fee . A professionally written press release about an important event can bring you many visitors and the backlink from a respected site to yours is a good boost to your SEO efforts. The tricky part is that you cannot release press releases if there is nothing newsworthy. That is why we say that news announcements and press releases are not a commodity way to build backlinks. There is much discussion in these last few months about reciprocal linking. In the past few Google updates, reciprocal links were one of the targets of the search engine's latest filter. 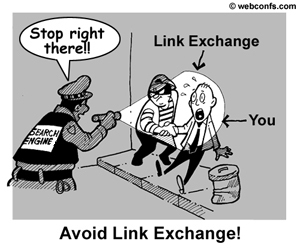 Many webmasters had agreed upon reciprocal link exchanges, in order to boost their site's rankings. In a link exchange, one webmaster places a link on his website that points to another webmasters website, and vice versa. Many of these links were simply not relevant, and were just discounted. So while the irrelevant backlinks were ignored, the outbound links still got counted, diluting the relevancy score of many websites. This caused a great many websites to drop off the Google map. There is a Google patent in the works that will deal with not only the popularity of the sites being linked to, but also how trustworthy a site is that you link to from your own website. This will mean that you could get into trouble with the search engine just for linking to a bad apple. One thing is certain, interlinking sites doesn't help you from a search engine standpoint. The only reason you may want to interlink your sites in the first place might be to provide your visitors with extra resources to visit. In this case, it would probably be okay to provide visitors with a link to another of your websites, but try to keep many instances of linking to the same IP address to a bare minimum. One or two links on a page here and there probably won't hurt you.